I’m in love…..My Kate Spade Lindsay Biscuit Patent Wedge arrived yesterday and they are gorgeous. Kate Spade is definitely back on my fashion radar. 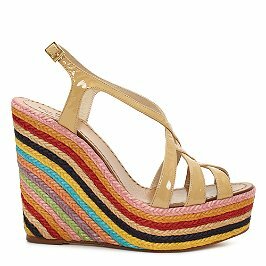 The Kate Spade Lindsay wedge is one of my summer must haves. These fabulous shoes pretty much go with anything, the rainbow wedge is to die for. I’ve been dreaming of these shoes since they made their debut.Get them while they’re hot because I have a feeling these babies will be hard to find soon. Make sure you try your true size on and a half a size up. I ordered them in my true size and they were a little small. I went on a hunt to find them and found that the half size bigger makes all the difference. I paid $275.00 for these shoes, but I think they are worth every penny because the possibilities are endless. These are a great investment to your spring & summer wardrobe. Enjoy! What shoes are on your must have list for this summer?